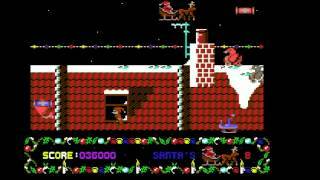 Play Santa's Xmas Caper online with Commodore 64 browser emulation for free! 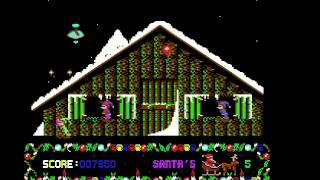 Santa's Xmas Caper (C64) game rom is loaded with features in our flash, java and rgr plugin emulators. Nothing to configure, we've done it for you! A Christmas-themed horizontally scrolling shoot-'em-up. Santa is attempting to make his annual gift-delivering journey while battling renegade pixies. As Santa and Rudolph journey over seasonal landscapes, the pixies attack with presents and bombs. Santa can retaliate by throwing his own presents at them. The game is divided into three main sections: Lapland, the Atlantic Ocean, and present delivering.